SHANGHAI, CHINA--(Marketwired - Dec 8, 2014) - On its fourth anniversary, The Ritz-Carlton Shanghai, Pudong in China was voted as the #1 Hotel in Asia by readers of Condé Nast Traveler in the United States. "It's the sort of place you dream of staying in." The 5 star Shanghai hotel fills the top floors of a 58-story financial district building that is a quick walk from the iconic Oriental Pearl Tower. 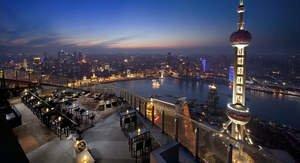 Guests have easy access to high-end shopping, and the Shanghai hotel suites -- "the largest and most luxurious I've seen in China" -- have views of the Huangpu River and the city's ever-evolving skyline. The lobby's dark woods and chrome are reminiscent of Shanghai's 1930s Art Deco era. In the 53rd-floor Jin Xuan, "excellently trained staff serve traditional Cantonese cuisine." -- Compliments by Condé Nast Traveler in 2014. Mr. Rainer Burkle, regional vice president and general manager of The Ritz-Carlton Shanghai, Pudong, was overjoyed when he received the news. He said, "With pride and excitement, we, the Ladies and Gentlemen of The Ritz-Carlton Shanghai, Pudong, are honored to be awarded by the readers of Condé Nast Traveler as the Best Hotel in Asia for 2014. It is the fourth time in a row that we have been recognized as the best hotel in China, and in 2011, we were voted as the world's #1. We are grateful for this honor and our guests' endorsement of our work. This encourages us to continue striving for excellence now and in the future." The Condé Nast Traveler Readers' Choice Awards are the longest-running and most prestigious recognition of excellence in the travel industry and are commonly known as "the best of the best of travel." Under Editor-in-Chief Pilar Guzmán, the Readers' Choice Awards have become more selective and specific to the passions that inspire today's travelers. Evaluation: Each candidate is rated, criterion by criterion, on a five-point scale: excellent, very good, good, fair and poor. Those scores, which represent the percentage of respondents rating a candidate excellent or very good, are averaged to determine the final score published here. The Ritz-Carlton Shanghai, Pudong opened on 21 June 2010. It is the luxury hotel brand's second hotel in the city, and it's seventh in China. Located in Shanghai IFC, the prime real estate in Lujiazui financial and entertainment center, the hotel complex is the masterpiece of world famous architect designer, Cesar Pelli. The 285-room Ritz-Carlton Shanghai, Pudong occupies the top 18 floors of the Shanghai IFC Tower I. With interior designs by Richard Farnell, style of the hotel is contemporary with hints or new interpretations of 1930's Shanghai Art Deco. This gives a great sense of place to the hotel as guest rooms and restaurants embrace magnificent sweeping views over The Bund -- the most intact collection of Art Deco architecture anywhere in the world. The Ritz-Carlton Shanghai, Pudong's guest rooms and suites range in size from 50 square meters to 410 square meters. There are three floors of Club accommodations and each club room enjoys access to the hotel's stunning Club Lounge on the 49th level. The hotel also offers a variety of dining options with four Shanghai, Pudong restaurants and a bar. The Ritz-Carlton Hotel Company, L.L.C. of Chevy Chase, Md., currently operates 87 hotels in the Americas, Europe, Asia, the Middle East, Africa, and the Caribbean. The Ritz-Carlton is the only service company to have twice earned the prestigious Malcolm Baldrige National Quality Award, an award that originated in 1987. Its purpose is to promote the awareness of quality excellence, recognize quality achievements of companies and publicize successful quality strategies. The Ritz-Carlton Hotel Company won the award in 1992 and 1999. For more information, or to make a reservation, contact a travel professional, call toll free in the U.S. 1-800-241-3333 or visit the company website at www.ritzcarlton.com. The Ritz-Carlton Hotel Company, L.L.C. is a wholly-owned subsidiary of Marriott International, Inc. ( NYSE : MAR ). Dedicated to "Building Homes with Heart", Sun Hung Kai Properties (SHKP) has followed a focused business strategy since it went public in Hong Kong in 1972. The company has a seasoned team of excellent management striving for business success and high standards of corporate governance. This solid foundation and leadership have made SHKP one of the largest developers in Hong Kong. Its trusted reputation for quality products and service has earned high praise from leading local and overseas professional and financial institutions. Besides its dedication in Hong Kong's premium projects, SHKP has been firmly anchored and strived for quality to develop landmark projects in mainland China. With a selective and focused investment strategy, SHKP is bringing its success and professional experience in Hong Kong to major cities, contributing to the development of mainland China. The Group owns several of Hong Kong's finest hotels, and has developed some premium hotels in both Hong Kong and mainland China, including the Ritz-Carlton Shanghai, Pudong at Shanghai IFC and another Ritz-Carlton at Hong Kong ICC.